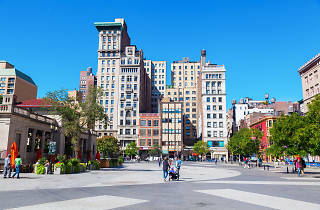 This park is named after neither the Union of the Civil War nor the labor rallies that once took place here, but simply for the union of Broadway and Bowery Lane (now Fourth Avenue). Even so, it does have its radical roots: From the 1920s until the early ’60s, it was a favorite spot for tub-thumping political oratory. Following 9/11, the park became a focal point for the city’s outpouring of grief. 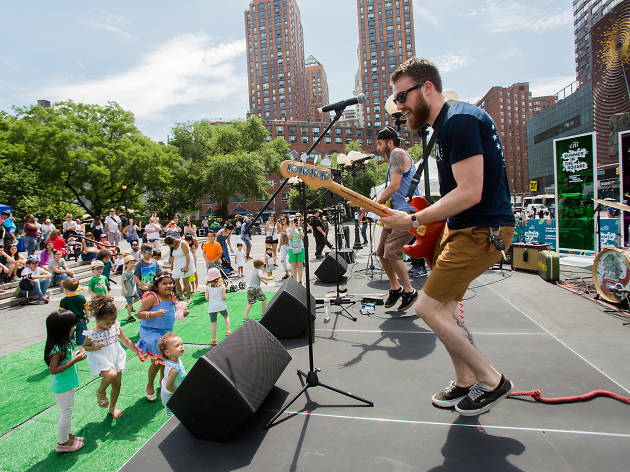 These days you'll find the lively Greenmarket in warmer months, holiday shops in the winter and a summer concert series for kids. Great public park, easily accessible by a bevy of subway lines, proximity to shopping and dining, and a wonderful farmers market (seasonal/weather permitting). 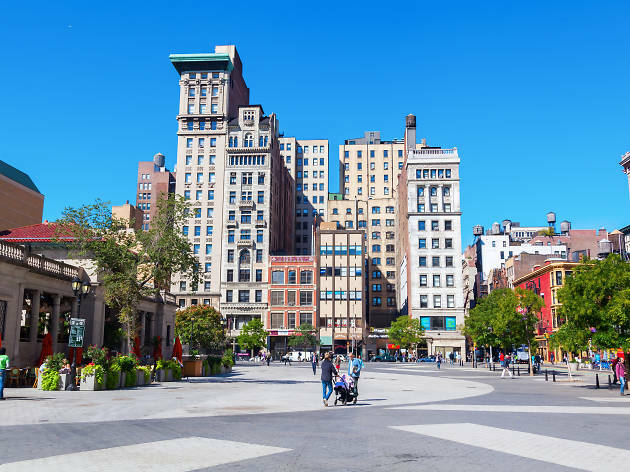 There are normally panhandlers (of all sorts - ranging from chess, to art, to performance, to protest, to religious in nature) towards the southern boundary, and Union Square has always been popular for political protest (generally liberal and/or radical). There are extensive seating and lounge areas, as well as smaller enclosed spaces, and a restaurant towards the northern boundary. Captures the young, quasi-rebellious attitude of the neighborhood. 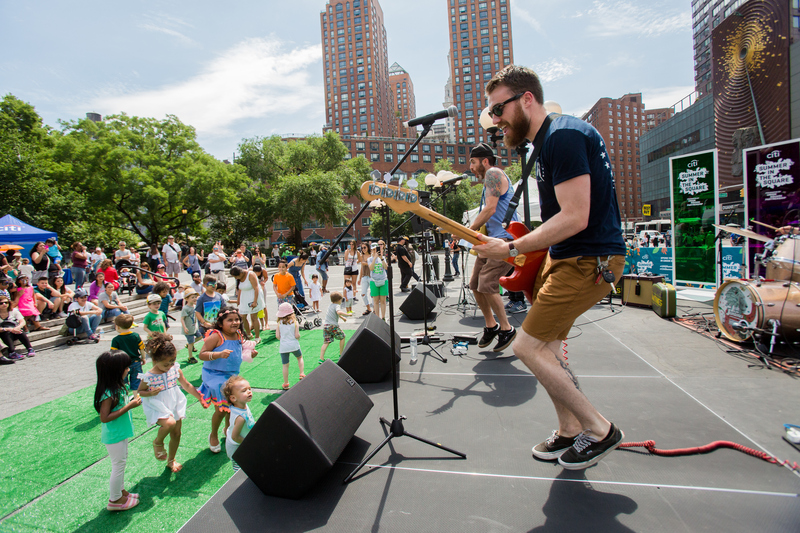 Many subways lead to this 14th Street park. To me, it separates the grid of uptown to the cacophony of downtown streets. The park is active year round. There is a small dog walk and plenty of tree covered benches to sit and relax at. In the summer and spring, there is an outdoor market selling fresh produce and treats. In the winter, there is a holiday village that sells ornaments, tree stands, and other holiday accessories. Towards the northern part of park, there is a seasonal restaurant and kids playground. Many rallies have been held here and I watched a snowboard competition there in the winter. The park is surrounded by retail and restaurants to keep you busy once you leave. Nice food, fine choise of wine and very fine service. All in all a good experince. We will be back - again!